They say people don't stare at these things. 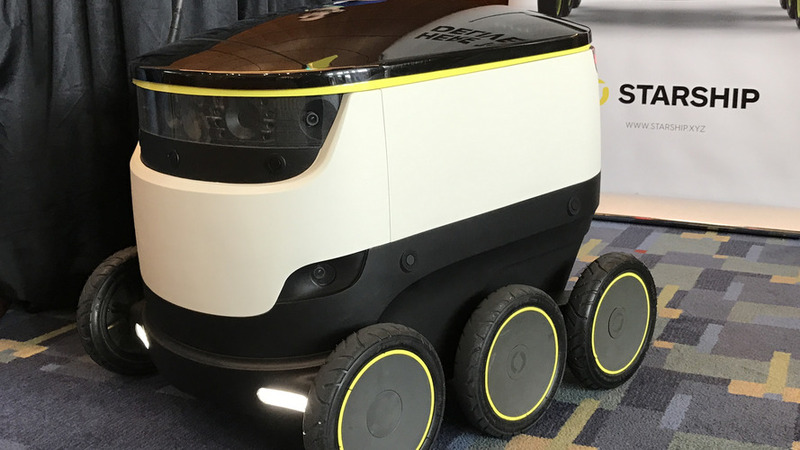 The most unbelievable thing that Henry Harris-Burland said during his presentation for the Starship delivery robots at the Washington Auto Show yesterday was that, in the cities where these MSE Droid-like wheeled cargo bots are currently operating, most people ignore them. Apparently, people can be too engrossed in their phones while walking down the street to notice that an autonomous robot is wending alongside them. Perhaps once Starship reaches its goal of having thousands of these things taking dinner and last-minute Internet orders to people's homes, it'll be normal to ignore them. For now, though, I want to see these things delivering pizza to the White House and not have anyone care. Harris-Burland is the head of the marketing and communications team for Starship, and said that the main idea here is to reduce congestion and make local, "last mile," deliveries cheap or basically free. He said that Starship expects the cost for a delivery of up to two miles to cost about a dollar. To do this, Starship has to come into an area and map it out using its own proprietary mapping software that gets loaded into the bots. Then, the shops/restaurants can put up to three grocery bags worth of stuff into the boxes and send them on their way. The six-wheeled robots are designed to avoid people and stairs and can't easily go inside buildings, so they just text you when they arrive at your door, anywhere from five to 30 minutes later. You come down, unlock the lid with your phone, and get your things. Starship is the project of Skype co-founders Ahti Heinla and Janus Friis, and the little droids are designed for the modern world. There's a way for someone back at the store to communicate to the person who ordered the item. You can try out a few different pairs of shoes, for example, and only keep the one that fits well putting the others back in the robot and return them instantly. Since the robots are fairly theft-proof (with locking lids, nothing on the outside to indicate what's inside, and loud alarms, tracking devices, and cameras that can make the robots easy to find if they are taken), there's little worry about, Harris-Burland said. I still think it'll be hard to ignore one of these boxes trying to take a few bowls of pho to hungry 20-somethings, but let's see where the next few years take us.